Storms can wreak havoc on anything in their path, and that includes your house. It doesn’t matter if you live in an area where storms are frequent or occasional. It only takes one storm to damage your property. Fortunately for you, Dowden Roofing has the knowledge, experience, and desire to fix any storm damage you might encounter. Part of your roof’s job is to protect you and your belongings during a storm, but it can only do so much. The severity of the storm is the overall factor in how well your roof does its job, but it’s not the only factor. 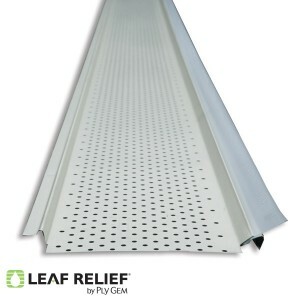 The condition of your roof also plays a part. If you’ve got a small leak, it can turn in to a small river by the time Mother Nature is done. If you’re missing a few shingles here and there, that gives high winds just what they need to begin picking apart the rest of your roof. The older your roof gets, the more often you should check the condition of it. Whether you do it yourself or hire a professional will depend on you and the type of roof you have. If you’re not comfortable doing it yourself, we will happily come take a look at it and offer you the best advice for your safety. If your roof has problem areas, we’ll repair them for you so you can worry less the next time a storm blows through. 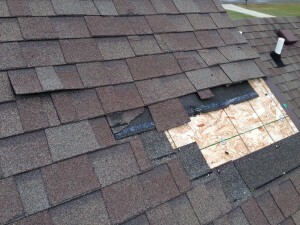 If the storm has passed and done more damage than is fixable, we can install a brand new roof for you, and then you’ll be ready next time Mother Nature comes knocking. Storms are not partial to roofs – siding, windows, and gutters can all take damage too. Siding can tear, split, and blow off; windows can get broken; and gutters can be ripped right off the house. If you find yourself in this situation, give Dowden Roofing a call. We are fully equipped to make all of these repairs for you. With the owner working and inspecting every single job, you can feel confident that your new repairs will last.